LoL Ping Checker - das kwoxt! 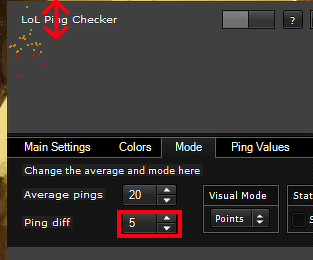 LoL Ping Checker (LPC) is a graphical tool showing your ping delay in a separate window. Many guys are still using the "old-school" cmd as ping tool with "ping google.de -t". Completly nothing is wrong with this. But here is just another "smarter" way. Here you actually get something that is really easy-to-use and having plenty of different settings for your own customization. The following picture shows the tool with the first settings page "Main Settings". Usually LoL Ping Checker is used in a minimized version (right button on the top). This fits anywhere on your second screen because you are able to resize the window the way you want it on the right or bottom side. This is how it could look like after playing a bit around with the size. For those of you that do not like it can minimize LPC even more. Just hit the left button on the top. After that if you even do not want to see these buttons, hit the F3 key on your keyboard. It's super easy and now you only have left the ping values and the pixels. If you dislike the ping values, just disable them in the config. Changing back to the settings view is possible with clicking F3 key again and after that the right button on the top side. You are able to see the window in-game as an overlay wherever you want. But it's also possible to move the window on a secondary screen to even see it if you are not using the windowed mode of League of Legends. It's fairly easy to hide the both buttons on the top side. Hit the F3-key to toggle visiblity. That's it! There are many preferences but the most important is for sure the correct server. Another also important setting is the ping difference. 5 pixels mean that the difference to the top is lowered by 5 pixels. So you have to consider what your average ping is so that nothing can ever be above that value. If you always have a 10 ms ping, set it to 10 or 9 pixel in ping-diff. LoL Ping Checker is still a pretty new tool. That's why bugs and issues can still happen. Be sure to send in all these things or even ideas you have to improve this project. Thank you. 3. In order to use LPC in-game you will need to set the Windowed Mode to Borderless or using it on another screen. Here is just an overview of the main features. Just play around with the tool. It's really self-describing. If you have questions don't hesitate to contact me. That is pretty cool if you are currently not playing. Just look on your ping and decide whether to play or not to play! If you dislike the colors given, you can change them. Nearly any color is change-able. You can set the amount of pings that are calculated into the average ping value. You are also able to change the delay between every ping. Be sure to not use the lowest because this might have a bad influence on your overall delay and of course CPU usage. Set it to about 500 ms should work pretty well and is enough to see your actual ping. Why should I use your Ping Checker? 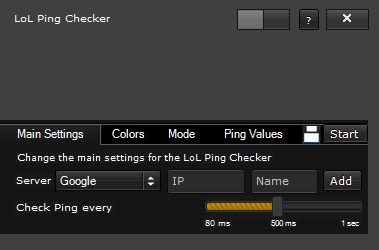 The LoL Ping Checker can of course be used without playing any game. It's great to see if your ping drops when you download or whatever you are doing. You can also use it to analyse your ping of your provider if you are getting lags in general. But that's another topic. It's mainly called LoL Ping Checker due to the integrated LoL servers. could u make the font bigger I can't see something in "6" 8 & higher maybe? or customisable? Could u explain a lil more about how it works? for example why there r 4 diffrent ping numbers? You can see the IP in the config file. Yeah I could show the IP also in the tool. Why not =) In the next update then. Which questions you have about the features? is it possible to get this for mac? Anyway great tool. I appreciate people who help each other. Hi man. Good tool. I'm going more chilled than I did before in-game when it's feeling laggy. Now I'm more sure about the fact that my PC is really bad thanks to your awesome tool. And again thanks and keep it on. Epic tool. Really good to see the ping in-game. Now what I need is to toogle the visibility. But as I have already seen it's in ya ToDo list. Great so looking forward to the next version. Yeah right more will come. It just didn't make it to this version. The design changes and rework did just take a huge amount of time. Great tool, works perfectly in-game. Such a good tool for those of us playing outside our selected server (South Africa on EUW). Connection is often dodgy so this helps so much. Used to have to create a custom game and wait 5 minutes for it to load etc just to check my ping. Thanks for the great program man! Amazing Tool For Sure Keep it on im waiting for the next version im sure its even better. Nice tool, I like to put it on my taskbar. A mode where the line is on the bottom would be nice. Hey hydro, actually that's a good idea indeed. Hey kwoxer, wieder mal Klasse Arbeit. Hab schon deine anderen Tools in Benutzung. Aber das hier hat auch wieder was nettes. Checke jetzt immer vorm zocken ob mein Bruder grad was zieht. Und das tut er oft. Hat mich schon einige Male vor dicken Lags bewahrt.